The recent weather conditions in the UK (rain, more rain, torrential rain) are precisely the reason why many Brits shun the idea of “staying at home” for their holidays. It’s just too bloody risky. 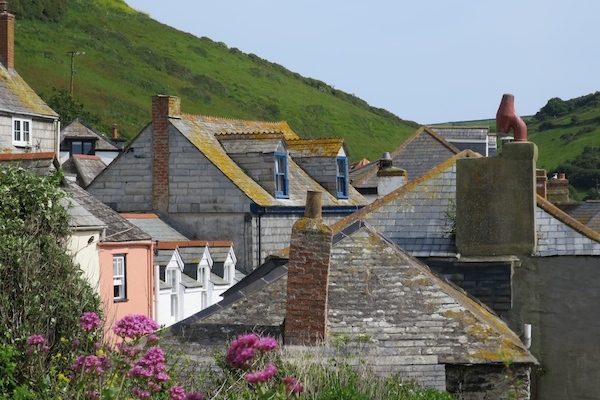 You could land yourself an epic week of blissful sunshine or you could, and this is far more likely, find yourselves holed up in a tiny cottage playing card games and bickering with your in-laws as the wind rattles the window panes. It’s like holiday roulette. But there are many great advantages to taking your summer holidays on home soil; for a start, you don’t have to go anywhere near Gatwick airport. Or Stansted airport. Or – God forbid – Luton. That in itself is surely worth at least three whole days of weather-enforced house arrest? Airports, apart from London City, which has everything down to pat, are the bane of my existence. Delays, queues, slow luggage carousels. And then there are the car hire providers with their damage excess waivers and their super-collision damage waivers and other things, who take the price that you have been quoted on the internet (€454) and multiply it by four. Then there’s getting to your holiday destination and having to go straight out to the supermarket before you can even have a glass of wine or a hunger-appeasing slice of bread, because you have arrived virtually empty-handed, because to have brought any more luggage than a rucksack would have incurred a €300 per-person-each-way penalty. Anyway. 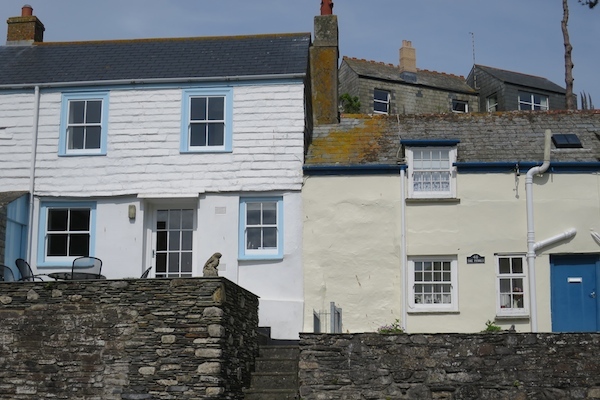 All of this is a waffling precursor to the main thing I wanted to tell you about, which was this: at the end of May, in the spirit of great adventure, I went on holiday with the parents and Mr AMR to Port Isaac in Cornwall. A proper, week-long holiday. At first, I didn’t even count it as a holiday, because you could simply drive all the way there. Drive, and not have some kind of stress-induced heart catastrophe or a burst facial blood-vessel. It was all too easy, which as we all know is not a holiday. But my Mum kept calling it a holiday, and so that’s what it became. 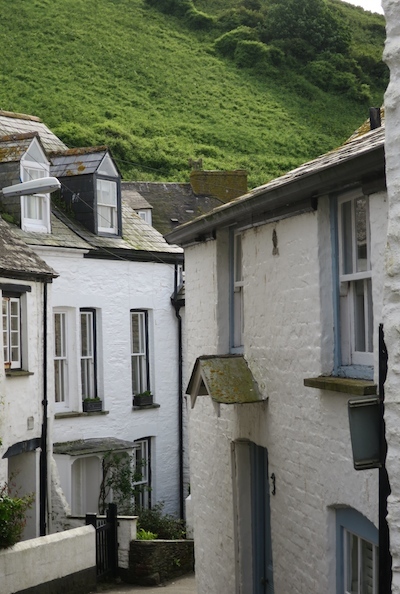 And so we found ourselves in lovely Port Isaac, home of Doc Martin and an incredibly charming seaside village-in-its-own-right. It’s an absolutely gorgeous little place, filled with all the crooked cottages and tiny, dark passageways that you could possibly wish for. (If, indeed, you wish for that kind of thing. I do, but perhaps I read too many novels and/or have an overactive imagination.) It’s the kind of place, if you take away the throngs of tourists, that makes you suddenly want to give everything up and opt for the “simple life”, sitting on a jetty making sculptures from bits of old fishing net and driftwood. I jest, of course – making sculptures from bits of sea-waste is probably quite hard work, and your manicure would take a battering – but I could totally imagine myself sitting in the top room of one of the weather-beaten cottages, watching the waves crash into the harbour and clacking away on an old typewriter. You could write some amazing pirate stories or thriller-mysteries. Where we ate: loads and loads of places. The best value meal we all had, by far, was up at a place called Fresh From the Sea. All they really serve there is freshly-caught crab and lobster – half, with a salad or with hunks of white bread and butter. So, so simple and really very inexpensive. You can’t order much else, as they don’t have the facilities to fry chips or what have you, but they serve up a very nice chilled glass of Chardonnay and it’s just a great place to grab a quick – luxurious! – lunch. 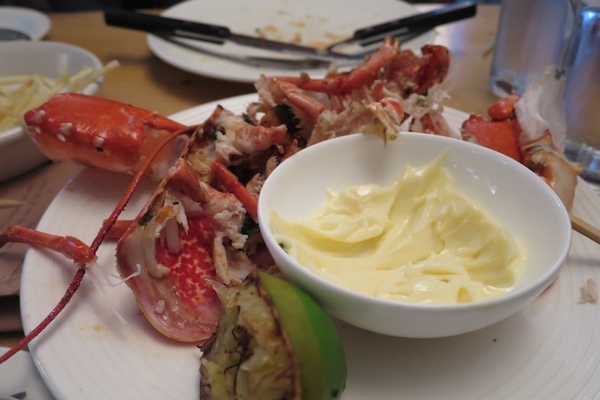 Half a lobster salad with a large glass of wine cost £14.50 – a crab sandwich, fresher than you can imagine, was £6.99. You can find directions to Fresh From the Sea on their website here. The best meal of all? Nathan Outlaw’s, down at the harbour. 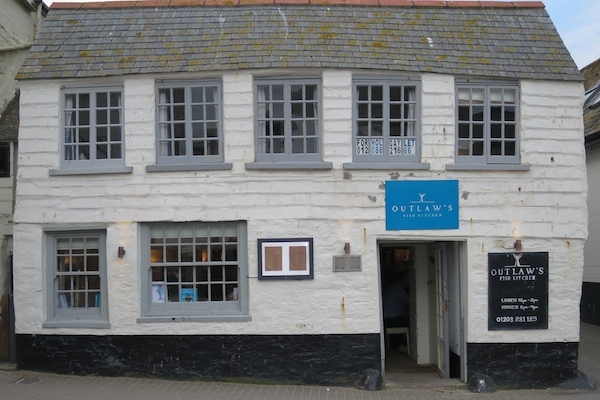 Outlaw has a Michelin-starred restaurant further round the coast, but the little Fish Kitchen right in the village just seemed too convenient to ignore. 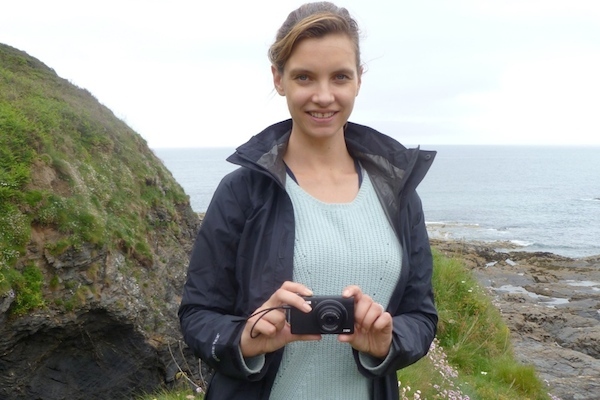 I hadn’t brought any glad-rags with me and neither had Mr AMR and by the time we thought about having a nice meal it was the end of the week and my hair was in dreadlocks and my clothes smelt of rain! 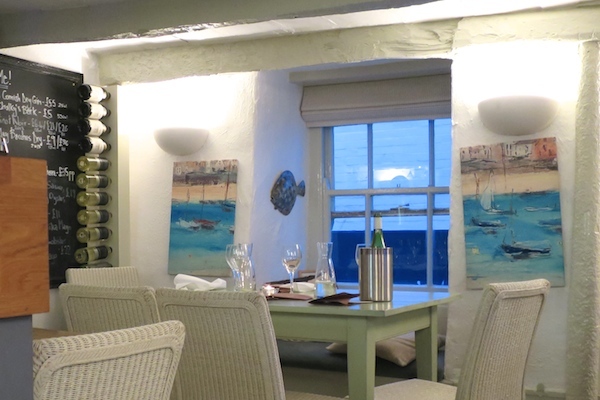 So the Fish Kitchen seemed like a wonderful, cosy option with its old, sloping beams and thick walls. Everything we ordered from the menu was perfect – just really fresh seafood, cooked in very interesting ways. Actually, quite a few of the dishes weren’t cooked, so there were zingy, fresh things that came out, soused in acidic little dressings, and then fried things and heavier morsels that were a completely different ballgame. All excellent. 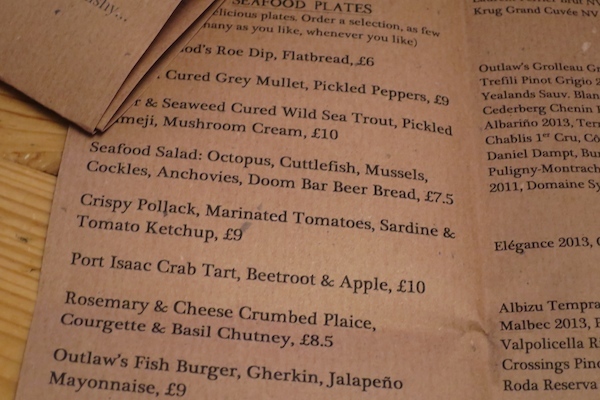 Here’s a snippet of the menu, just to get you really hungry! We had almost everything from the list you can see; the dishes are all quite small and meant for sharing. It does look as though it would work out to be rather expensive, but bear in mind that you don’t have a “starter”, per se. We spent about £50 per head and we were absolutely stuffed. To be honest, if I hadn’t been intending to write about the food, I would probably have stopped at about £40 and that would have been plenty! 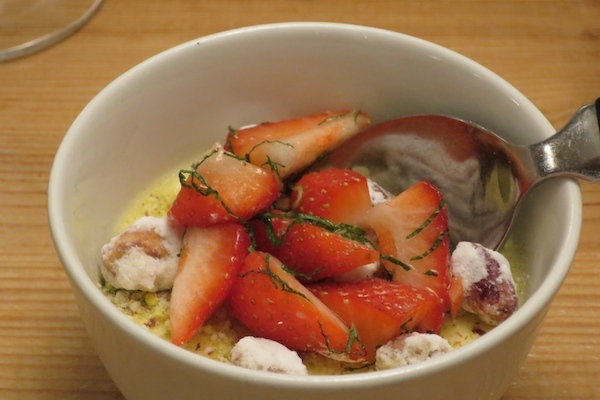 The pudding of dreams, above, was (if I remember rightly) some kind of lemon posset with candied pistachios and the most incredible strawberries. If you go to Outlaw’s then get it! And I shall leave you on that very satisfied, stuffed-to-the-gills note, because it’s 11.30pm and a long way to breakfast and I don’t want to work my stomach up into one of those weird thought-induced hunger-frenzies! 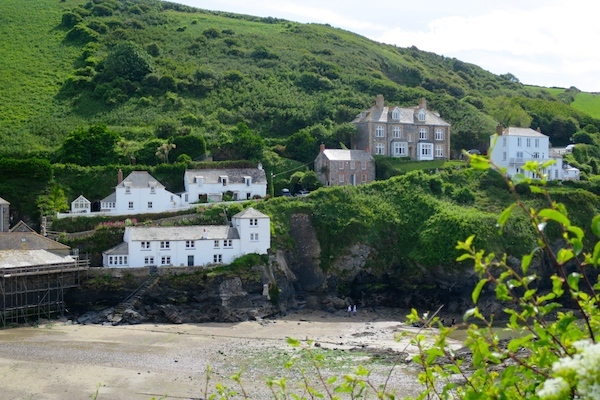 Can’t recommend Cornwall enough, really, especially the gorgeous little seaside villages. I’ve been to quite a few now, all around the coast, and they are superb if the weather is good, almost as superb even if the weather is shocking. Take wellies and a waterproof and you’ll never be short of activities. Your own comments and recommendations below, please, should you have any! And also: Doc Martin. Discuss. 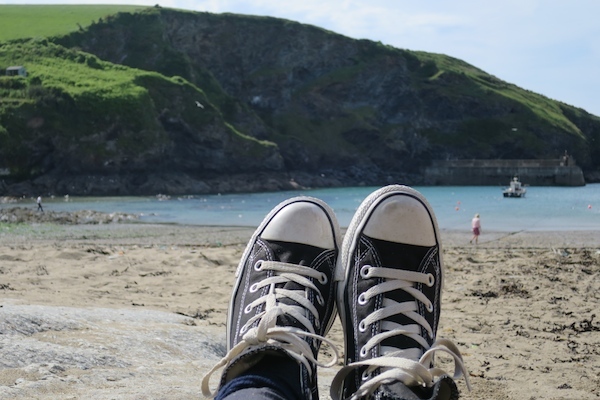 *Have just realised that I called this post What I Did in Port Isaac, and I haven’t even begun to tell you what I did! Lots of walking, more walking, lots of walking. We nearly got chased by a bull, which was a low point, but apart from that we walked unscathed.